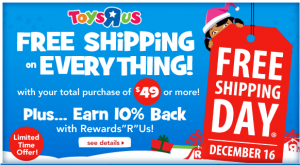 Toys ‘R Us: Two Day Mega sale – gift card offers + more! 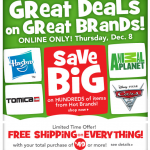 You are here: Home / National Stores / Toys ‘R Us: Two Day Mega sale – gift card offers + more! Toys ‘R Us is having a 2 Day Mega sale today and tomorrow. There are some HOT deals you can score in store (including gift card offers) and deals you can score online, too! Online, you can grab FREE SHIPPING on any purchase of $49 or more PLUS you’ll get a 10% Rewards ‘R Us bonus! Here are some of the deals you can grab online: there are many more! 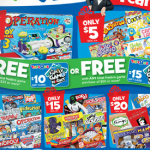 Toys ‘R Us: Toy Story 3 Operation only $1 + other Hasbro game deals! 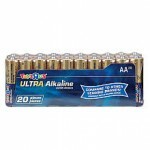 Toys ‘R Us BOGO free sale on batteries: 2 packages for $6.99! 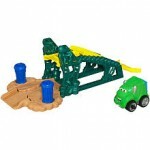 Toys ‘R Us Online Only sale + bonus offers + 7% cash back!